and for an outside wedding ceremony, "Jardin d'Amour" is the picture of perfection. The Lebanese Mediterranean mountainous overviews and the surrounding man made waterfalls make a gorgeous backdrop for your wedding party. Mission:Say 'I do' at The "Jardin d'Amour"!Tie the knot in our stunning indoor wedding venue, then host a party to remember for 50-500 guests in our beautiful themed rooftop gardens.We're here to make organizing your wedding day as stress-free as possible. We assign you a dedicated Wedding Executive, and can take care of all your wedding must haves to make sure you enjoy every moment of your special day! Why us? 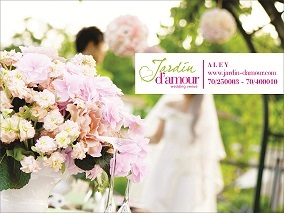 Can you think of a better place to get married in Lebanon than at the JARDIN D'AMOUR? We hope not, because we love Weddings!, We can arrange receptions for a minimum of 50 guests to larger, more elaborate celebrations, but in such a unique events space, it seems a shame not to pull out all the stops. Talk to us about what you’d like, and we’ll be delighted to help! FAQ: YOUR WEDDING QUESTIONS ANSWERED !- How do I book the registrar for my ceremony? If you are planning on getting married here at The JARDIN D'AMOUR, please remember to contact the administration registrars to check their availability and to secure your date.You can book up to one year in advance.